There were lots of highlights from the Charlotte Christmas Bird Count conducted last Saturday, so many in fact that the final count resulted in a record-high species count for this 75 year old tradition. 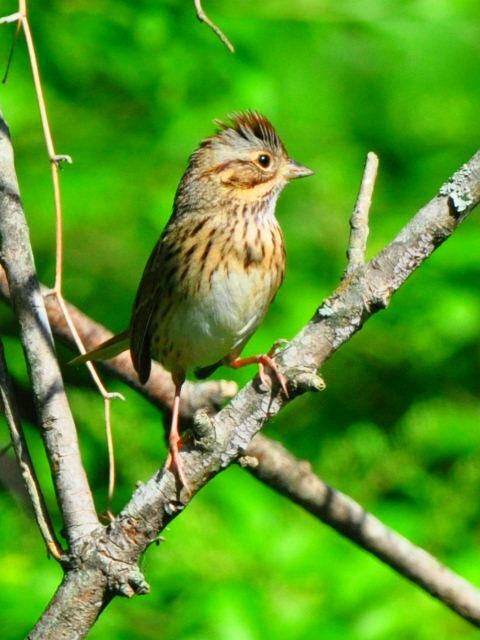 Area birders were able to tally 98 species, besting the previous high of 96. Lingering semi-hardy species were responsible for the high count; those species that normally would be gone from the area if not for the near-record high temperatures that have dominated the count period so far. My day started at Renaissance Golf Course off Tyvola Road. For the first couple of hours I would not have guessed a record setting day was looming. Not an owl or American woodcock could be coaxed to sound off before dawn. Once the sun came up the birding remained slow and we had to work for everything we got. Some nice local finds like orange-crowned warbler and white-crowned sparrow put in appearances but those are reliable at that site. A fox sparrow, in short supply this warm winter, sang back in response to a tape playback. It really changed mid-morning when we heard the unmistakable nasal calls of a blue-gray gnatcatcher, an abundant summer resident but rare in early winter. I gave a few squeaky calls back and the little bird flew right in. Since we were standing next to a small wetland, I clapped my hands loudly to try to entice any rails present to sound off. To my surprise a sora immediately gave its alarm squeak. That’s another common migrant that should have moved out by now. Back towards the 18th green, a shrubby, weedy embankment produced the best bird of the day, a Lincoln’s sparrow. That’s a species hard to find at any season let alone early winter. They are skulkers but can be induced to come in to squeaky sounds, which is what this bird did. While we were enjoying the sparrow a common raven flew over, a permanent resident but sometimes hard to find. Those were just my highlights. Others I have heard about from other groups included green heron, spotted sandpiper, rufous hummingbird, black-and-white warbler, common yellowthroat, and loggerhead shrike. Spotted sandpipers winter along the coast in small numbers but very rarely this far inland, and then usually are restricted to waste-treatment plants. Green herons are like the spotted sandpiper, present in small numbers along the coast in winter but usually not in the piedmont. Soras are like small chickens that live in marshes. In years where the local waters do not freeze regularly they can be found in appropriate habitat. These tiny songbirds are insectivores so warm weather in early winter provides them a food source until the onset of cold. Shrike numbers have plummeted over the last few decades so that this once-common permanent resident is now a bona fide rarity in Mecklenburg County. I haven't seen one this year. Another common breeding bird, the common yellowthroat lingers in wet areas in warm winters. 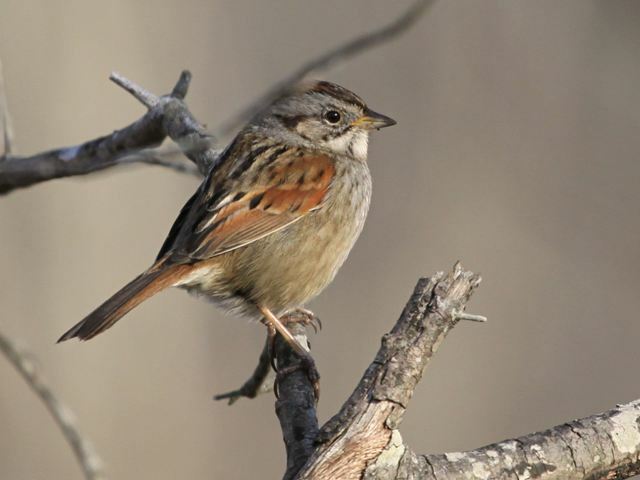 This species may be more overlooked in winter due to its similarity to other sparrow species. still, even if present it is in small numbers. 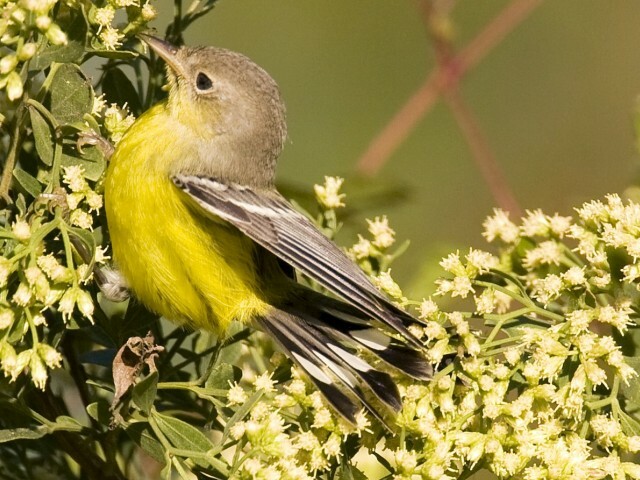 This warbler gleans insects from bark crevices so it can linger longer in winter than species that glean from foliage. This bird is wintering in Myers Park; the only hummer I know of in the county yet this winter. To the uninitiated, sparrow identification can be frustrating endeavor. I suspect many a promising birder has been turned off by a day in weedy sparrow fields. They all are little brown jobs. During the Charlotte Christmas Bird count I was able to locate a Lincoln’s sparrow, a species that is both often mis-identified and often overlooked. Swamp sparrows are often called Lincoln’s sparrows by the over enthused birder while the more laid back birder may actually call a real Lincoln’s a song, savannah, or swamp sparrow. Lincoln’s sparrows are tough to find here at any season though. Too bad because they are subtle little beauties. Take a look at the photos below of a Lincoln’s sparrow and its look-a-likes. Lots of sparrows are streaky little brown birds. the Lincoln's above combines common characteristics of streaky breast, a middle breast spot, and streaked crown. In the Lincoln's, note the nice buff wash across the top of the chest and the fine vertical streaking of the chest. 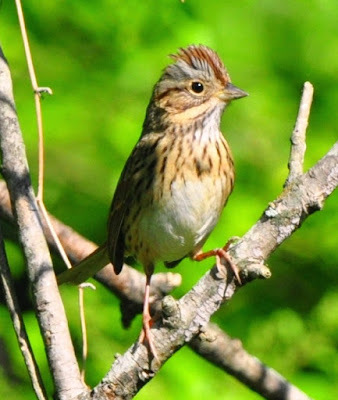 The combination buffy and gray face makes this a Lincoln's sparrow. The species also has a slight crest which it will raise when alarmed, just as this bird is doing. Savannah sparrows are more heavily streaked on the breast, lack the buff wash there, and have white and sometimes a yellowish wash on the face. 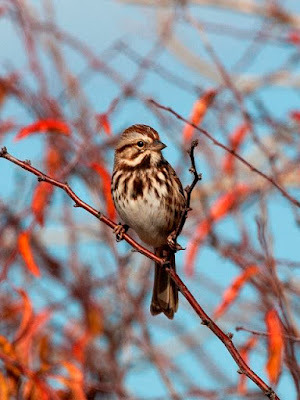 Song sparrows are perhaps the most abundant sparrow in our area in winter. Note the even heavier streaking with heavier central breast spot. Compared to the daintier Lincoln's, song sparrows are much bulkier and overall much larger. Swamp sparrows can show alot of buff coloring and some diffuse streaking with a central breast spot on the underside. The buff is in the wrong place though, restricted to the flanks. and they never have the clearly defined streaking of the Lincoln's. Every winter brings subtle differences to the local populations of our wintering birds. Casual observers may not notice, but some species are more numerous in some years than in others. The reasons are complex and varied. 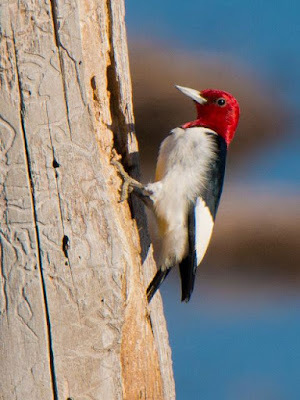 Active birders have noticed there are significantly more red-headed woodpeckers around this winter than in recent years. Unlike some of our local woodpecker species, the red-headed woodpecker is a highly migratory species. Some years they move south in larger numbers than other years. Many of the birds being seen right now are immature birds lacking the brilliant red head of the adults. I have noticed an increase locally in the past couple of months. Every beaver pond and flooded low woodland has multiple birds chattering and quarreling in typical red-headed fashion. They are the hot heads of the woodpecker tribe. 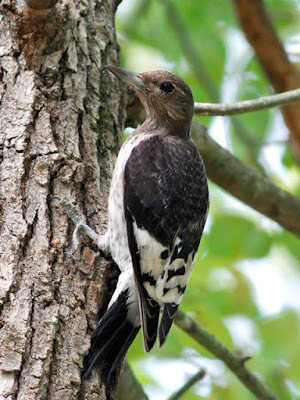 Red-headed woodpeckers love open country with scattered large oak trees; and flooded woodlands influenced by beaver activity. They are conspicuous both with their gaudy and highly contrasting plumage and constant noisy chattering. 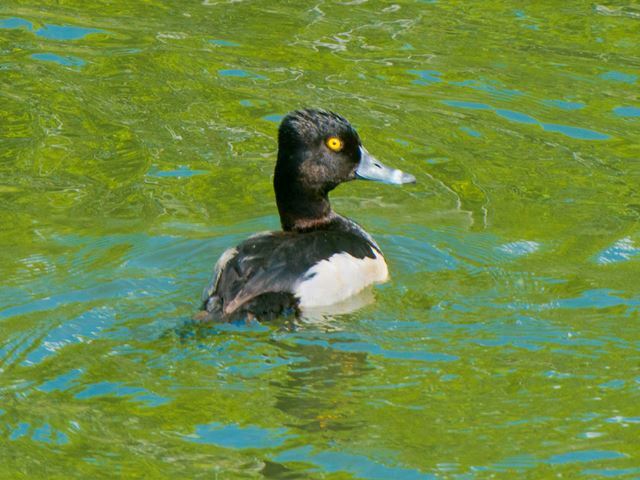 Many of the birds in our area right now are immatures which lack the red head and solid black back. The white wing patches also have some black feathering unlike the adults. Last weekend’s Christmas Bird Counts in Gaston County and Southern Lake Norman offered great birding weather, cold starts with gradual warmups through mid-afternoon, but I had to work pretty hard for everything I got. The numbers of birds just seem to be down so far this season. The activity in the brushy fields and thickets is a bit off. That’s not to say there weren’t any highlights. Saturday in Gastonia I was surrounded by at least four American woodcock displaying at close range from 6:30 AM to about 7:00 AM. I even got to see some sitting on the ground in the beam of my flashlight. Later, an orange-crowned warbler and a palm warbler in a weedy field were nice finds. At Rankin Lake I found more red-headed woodpeckers than ever before; this is clearly a good year for that species. I met some other birders for owling at 5:30 AM at the Davidson College campus on Sunday morning. A barred owl immediately let loose with a “hoo-aw” call, apparently startled by the slamming of a car door. An hour of playing playback of Eastern screech owl calls finally induced one of those little owls to answer. Well after sun-up a great horned-owl hooted twice to give us the owl trifecta at one spot. But birding the rest of the morning was more challenging. I was happy to pick up two brown creepers and up to four pine warblers in a small flock but numbers were down. The same conditions continued at the Davidson Greenway where many species we usually find were just absent. But there were some nice surprises as always. I mentioned the Cape May warbler yesterday. 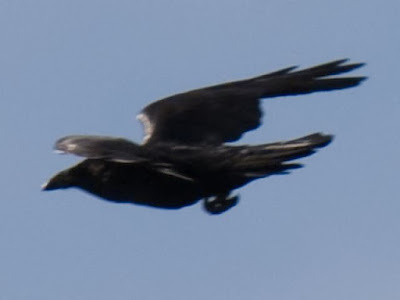 Other groups in other parts of the circle found seasonal rarities like common raven. greater yellowlegs, gray catbird, and rehead (a duck). 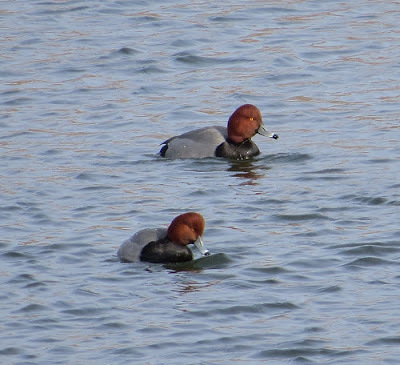 Redheads are handsome ducks that are uncommon in our area in the winter. Common ravens are not so common here. There are a few pairs around here but they are infrequently seen. Greater yellowlegs have usually moved out of the area by now. 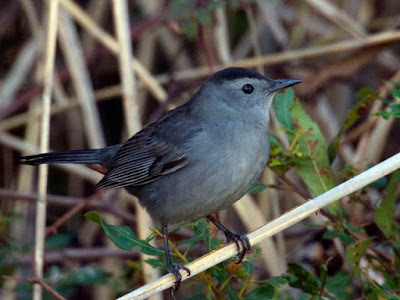 Gray catbirds can persist in the western piedmont in years of mild weather, but generally move a bit east to the coastal areas. While going through a feeding flock of small land birds on Sunday's Southern Lake Norman Christmas Bird Count I was caught completely by surprise by one little bird that flew in to within 10 feet of me on the Davidson College campus. The bird was small and predominantly yellow at first glance. I immediately thought "pine warbler" but I quickly noticed the presence of sharp black streaking on the upper and mid breast. 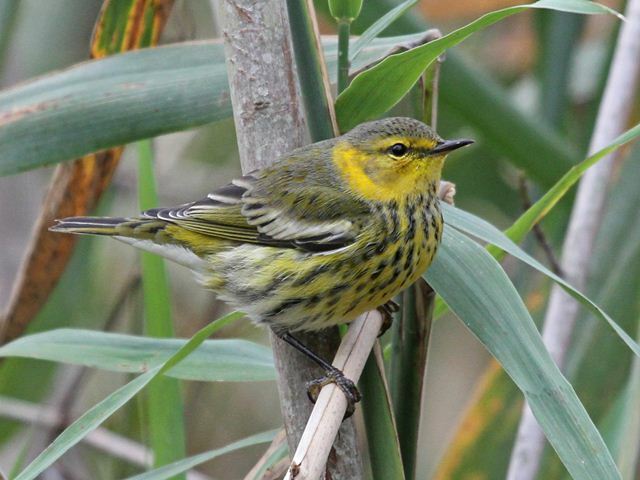 CAPE MAY WARBLER!! Cape May warblers come through our area every spring and fall and are not too hard to find. But one in mid-December is astounding; so much so that there are very few winter records for the entire state. When they are found it is usually at a feeder where a constant source of protein can be gotten. That bird needs to find a suet feeder in Davidson before it turns too cold. 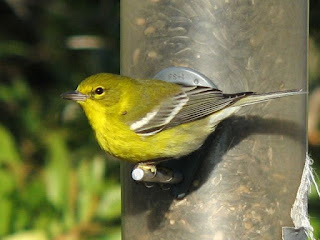 Compare the above photo to the one of a pine warbler below. Pine warblers are the only expected small yellow bird to be found in our area during the winter. Note the conspicuous black streaking on the breast of the Cape May. The species also has one large, thick whitish wing bar on the shoulder. Pine warblers are pretty clear-breasted except for some diffuse faint streaking on the sides of the yellow breast. Note also the two prominent wing bars on the pine. Both photos depict males of each species. Last Monday kicked off the 116th year of Audubon’s Christmas Bird Count, the longest running citizen science project. Every year birders look forward to the Christmas Bird Count season that runs from December 14 to January fifth every year. It’s an opportunity to spend a day in the field birding alone or in an organized group and collect data that is actually used to analyze short and long term trends in bird populations. I spend five days participating in Christmas Counts. Saturday I am in Gaston County. Sunday I am in Davidson for the Southern Lake Norman Count. Charlotte is the 26th, Wilmington, North Carolina is January second; and Southport, North Carolina is January third. That’s five Christmas Counts and there are many who participate in more than that. This is the most exciting and anticipated period in the birding year for many birders. There are more local counts that I just cannot help out on; York / Rock Hill, Iredell County, and Pee Dee NWR. Every count area is a 15-mile diameter circle. Groups fan out to check assigned birding hotspots in their assigned section, sometimes starting for nocturnal species well before daybreak and finishing at dusk. As a rule I get started by 5:30 AM for each count I take part in. It is an exhilarating experience to watch the day break on a cold, still December morning with the owls and American woodcock vocalizing. Add a bunch of Geminid meteors and it is truly special. It is also exciting because with so many birders in the field at one time some nice rarities are sure to be found. A top notch rarity or two always spices up any count. That is where you come in. 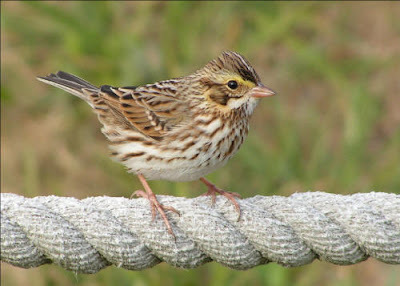 Some uncommon birds are easier to find at feeders instead of in the field. 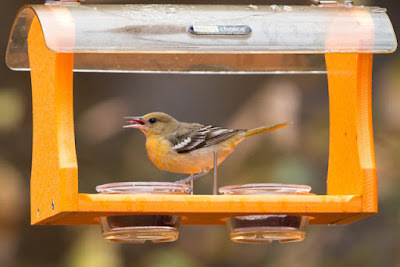 Hummingbirds, orioles, and some odd warblers develop site fidelity with their favorite feeders and become easy to see. If you are seeing any of those regularly at your feeders let me know and I can pass it along to the compiler for that area, if you happen to live within a count circle. Even if you don’t live within a count area I still want to know what odd stuff you might be seeing. I joined some members of Mecklenburg Audubon last Saturday as they did some birding in the Concord Mills area of Cabarrus County. The main goal was to check area wetlands and ponds for arriving waterfowl. The first stop proved to be the nest of the day. There is a vast wetland behind the HH Gregg store on Speedway Boulevard. This spot has proven through the years to be a waterfowl magnet. There is something out there virtually every month of the year. Adding to the site’s attractiveness to birders is the ease of access and relative close proximity of the birds. Great views can be gotten with only a set of decent binoculars; a spotting scope can make for some killer looks. It is also good that the ducks are not skittish at this site. Ironically the best bird of the day was heard and then seen as I walked up to join the group there. 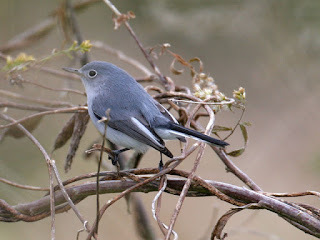 A blue-gray gnatcatcher, a rare bird in the piedmont by late November, was foraging in the brush right by the parking area. Attention to that bird was brief as it became evident very quickly that there were lots of ducks in the marsh. 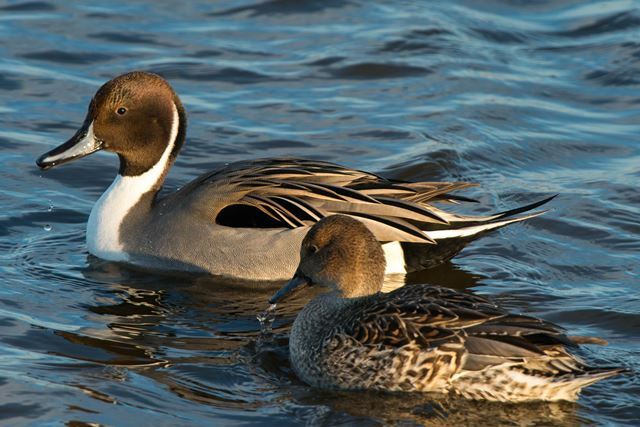 Leisurely, beautiful looks were gotten of 29 northern pintail, a big number of this locally uncommon duck. Other waterfowl included 4 gadwall, 12 Northern shoveler, 15 mallard, 4 green-winged teal, 5 hooded merganser, and two pied-billed grebe. The sun angle was perfect for exposing the colors on the male ducks. The green-winged teal drakes showed off their bright green wing patches and eye stripes. A mute swan has been present at the site for years; this is almost certainly an escaped ornamental bird instead of a wild one. Non-duck birds included a hunting belted kingfisher, a statuesque great-blue heron, and a few red-winged blackbirds. A bonus siting was two river otters frolicking in the water just below our vantage point. 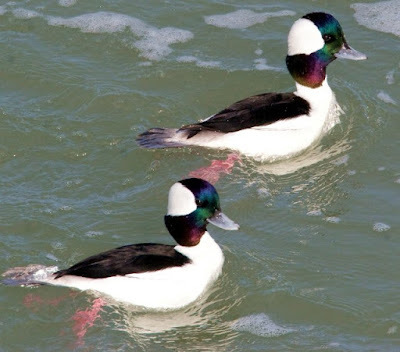 We then headed across Speedway Boulevard to the pond in front of the mall to add bufflehead, ruddy duck, American coot, and ring-necked ducks. If you want to get easy looks at area waterfowl I highly recommend these two areas. They always produce and can provide some nice photographic opportunities with the right equipment. I spent last week at Ocean Isle Beach, North Carolina, where I spend every Thanksgiving. 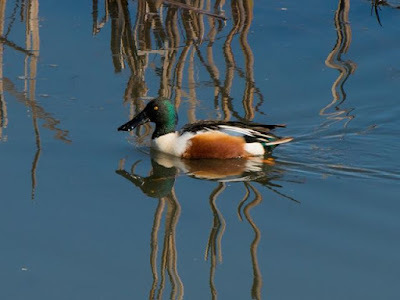 The birding is always great there at any season and offers a change of pace from inland piedmont birding. Reports from the northeastern United States from a couple of weeks ago indicated eastern invasions of both Franklin’s gulls and cave swallows. Both are western species that show up in large numbers on the east coast every few years. I spent a good amount of time looking for both but I didn't find any. All the time in the field wasn’t for naught though. I was able to reconnect with a couple of shorebird friends that I have gotten to know over the years. I get a feeling of contentment whenever I can report resighting a banded bird. 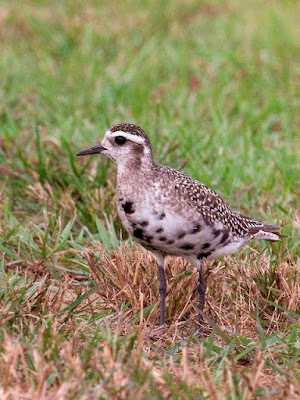 It lets me know they are living their lives and doing OK.
One afternoon I had a pleasant surprise when an American golden-plover decided to drop in on the first fairway of Brick Landing Golf Course on its way to South America. Golden-plovers are regular but uncommon migrants through the Carolinas so it is always a treat to see one. I was able to study this bird at leisure as it picked insects off the short grass. 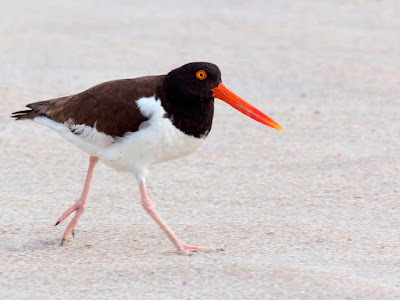 Oystercatchers are among the most striking of shorebirds. There is little chance of a mis-identification. 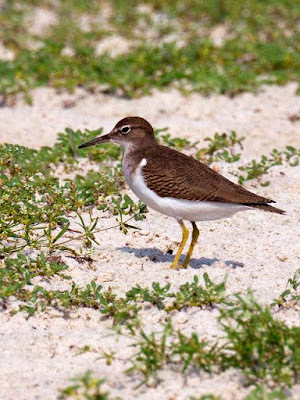 Note the green leg bands on the adult bird below. The color indicates which state the bird was banded in. American golden-plovers are uncommon migrants thru the Carolinas, and can occur from the coast to the mountains. The similar black-bellied plover is generally more coastal but may wander inland too. Goldens are a daintier bird than the black-belllieds. 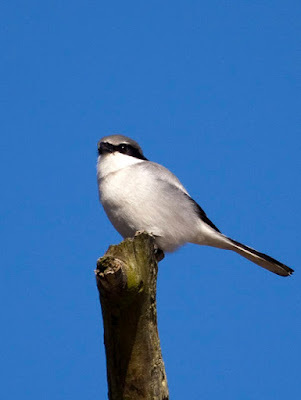 Note the heavier, thicker bill on the black-bellied below. 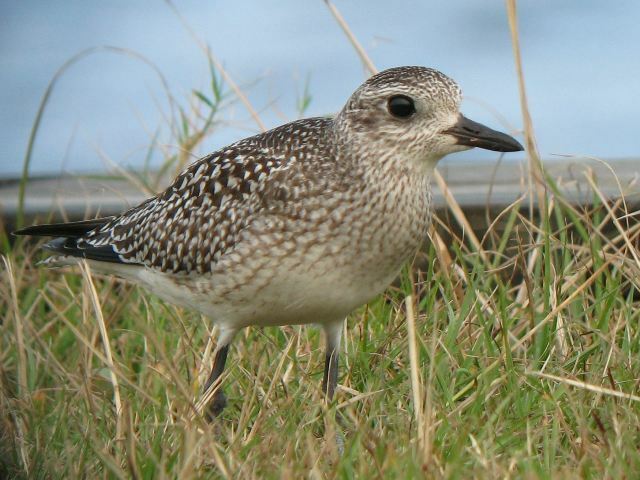 The species is also larger and bulkier than the golden-plover. It’s the week before Thanksgiving and as winter approaches it is timely to discuss…hummingbirds. 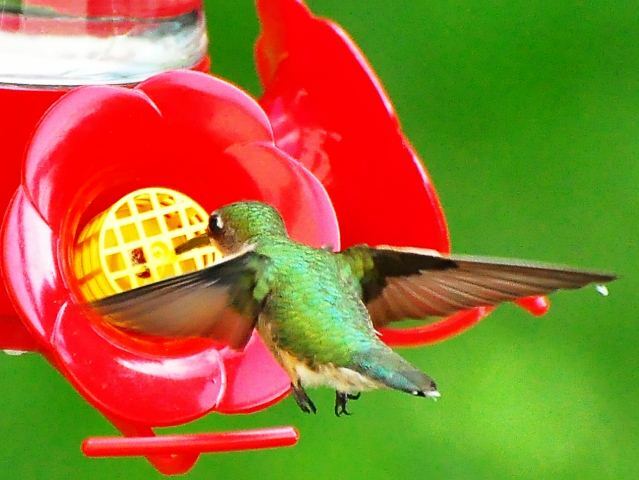 You might think hummingbirds would be a more appropriate topic for the early spring, but not necessarily so. The week of Thanksgiving is traditionally when the reports of rufous hummingbirds really start to come in from area feeders. A few weeks ago I briefly mentioned the movement of some western species of hummingbirds; primarily rufous hummingbirds; into the southeastern United States. Well now is the time to really be aware of their presence. Any hummingbird still patronizing area feeders after November first needs to be closely scrutinized. Superficially the female and immature male rufous hummers closely resemble the ruby-throated hummingbird females and immatures that were so abundant a couple of months ago. Those birds have moved on. Any remaining hummingbird is almost sure to be a species from the western United States. With a good look a casual observer can tell the difference. 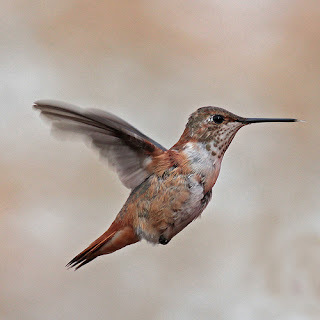 Look for a buff wash on the flanks and sides of the rufous hummer. Often there will be an area of dark pigmented feathers in the center of the otherwise pale throat. 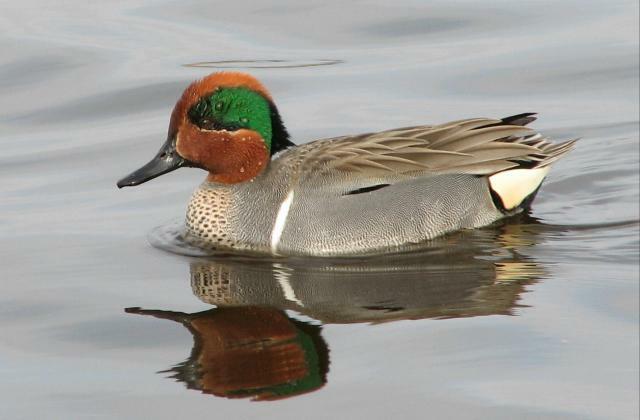 A good look at the tail, especially when spread, should show some brighter reddish brown color mixed in with the green. If you still have a hummingbird let me know about it, and try to get a photo of it. If you have taken your feeders down, I recommend mixing some fresh sugar water and putting the feeder back up. 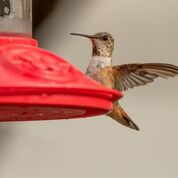 If your feeder is still hanging, freshen it up and keep a close eye on it for activity or falling water level. I already have heard of one bird that is still at a feeder in Union County. There will be more discovered in the coming weeks. I keep track of wintering hummingbirds each year; recording arrival dates, departure dates, and locations. Some years several dozen birds are brought to my attention. If a photo or a report sounds especially intriguing, as if it could represent a really rare species, I may want to come take a look. 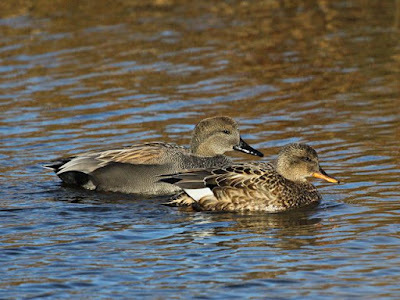 The late fall season has already been notable for western species moving into the eastern United States, including North Carolina. There is no reason to think that trend will stop now. Note on the female rufous hummingbird below the dark area on the center of the throat and the reddish brown plumage on the sides of the tail and flanks. On females and immature females, the amount of red can be somewhat variable, so look closely. The reddish plumage is even more prominent on this immature rufous hummingbird, likely a male. The ruby-throated hummingbird female is even drabber. Note the unmarked white throat and no hint of red or brown from the side or back view. Both photos are of the same bird. Every fall I get inquiries from backyard birders concerned about a sudden lack of feeder activity. Some of the reason for the decline in activity may be due to the migration out of our area of many birds. I think the main reason however is the abundance of natural food that is available right now. In the treetops, sweet gum and tulip poplar seeds attract finches, Carolina chickadees, tufted titmice, and brown-headed nuthatches. Low to mid-level vines like poison ivy and Virginia creeper are important food producers for warblers, sparrows, thrushes, and mimic thrushes. In the weedy fields and hedgerows, fall-blooming asters have seeds that are maturing and thickets of pokeweed attract cardinals, mockingbirds, and sparrows. Make sure seed in feeders is still viable too. Seed can go bad and become unappetizing to birds after prolonged periods of damp weather. Make sure seed is loose and dry on the interiors of your feeders. This is not to say that feeding the birds now is a futile endeavor; periods of rainy and unsettled weather will still bring birds in to stocked feeders. But feeder activity may not peak in your immediate area for a month or so. It really all depends on how long it takes for the natural food to be depleted. Other questions I often get are whether to clean out old nest material from nest boxes and whether to leave the boxes up in winter or take them down. Remember birds that nest in cavities and boxes also prefer to roost in cavities and boxes. By leaving a box up through the winter you can provide needed night time shelter. Old nest material can provide some added insulation on unusually cold nights too. You may start to see a bully Northern mockingbird chasing birds away from your feeders now too. Mockers establish winter territories and vigorously defend them against seemingly every other species. If this happens to you, consider spreading your feeders around the yard. The mocker might still try to defend them but will eventually grow tired of the constant chase. You might even try giving the mockingbird its own private feeding area. Stock a station with suet, grapes, cranberries, and mealworms; foods mockers prefer over dry seeds. For the second time in two months I made a chase for an ultra-rare bird. 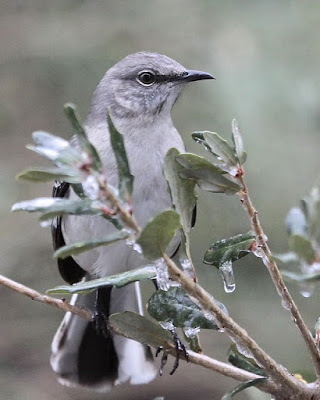 Last Wednesday I was off at 4:45 AM for Swannanoa, between Black mountain and Asheville, to look for a sage thrasher that had been found on the campus of Warren Wilson College. 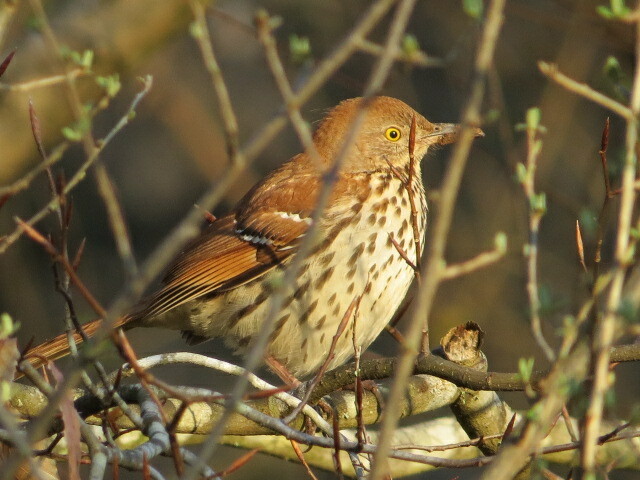 There are only two previous records for sage thrasher in North Carolina, and none since 1975. This is a super-rarity anywhere in the eastern United States. The specie’s normal winter range is south and west Texas west to Arizona. 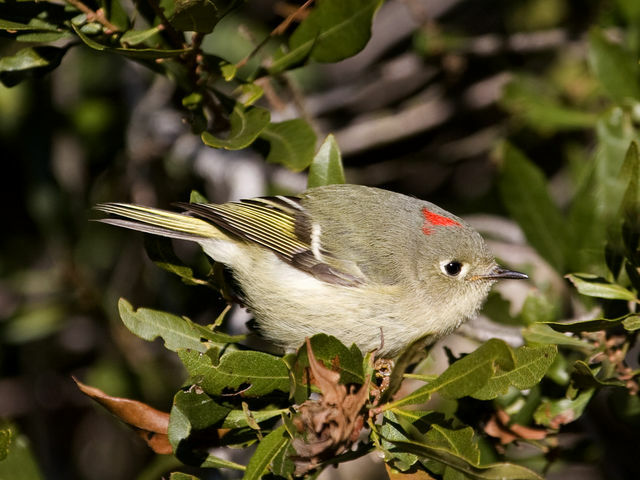 They nest in the sagebrush of the western United States. As thrashers go they are very small, about eight and a half inches long. For comparison our local thrasher, the brown thrasher, is eleven and a half inches long. But all other marks clearly identify the bird as a thrasher; the streaked breast, yellow eye, long tail, and slightly drooped bill. We arrived at the site, a weedy hedgerow with scatted shrubs and abundant multiflora rose and poke weed fruits, before 7:30 AM. Already there were four other birders from Winston-Salem present and as we approached they indicated the bird was in view and feeding intently. I raised my binoculars and ticked off state bird number 412. So easy it was almost embarrassing. Some birders had missed seeing the bird despite hours of looking, while others were catching intermittent brief glimpses during extended searches. Sage thrashers are skulkers, prone to disappearing into thick brush for much of the time. The sage thrasher is an olive gray on the back instead of the bright reddish-brown seen on our familiar brown thrasher. Thrashers are first cousins to mockingbirds, and from the back this bird looked remarkably like a Northern mocker; just not as clear gay as that species. 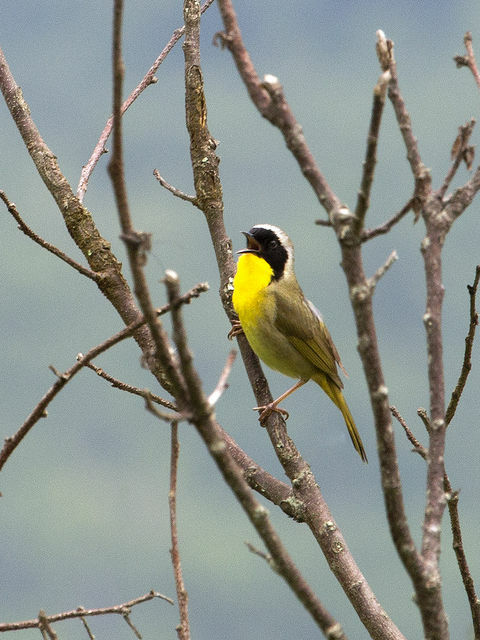 As is often the case with these rarities, the number of birders who will make the trip to Swannanoa to see the thrasher will approach or even surpass 100. At least one birder came in from New York. 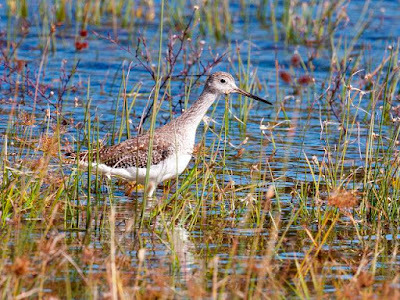 It’s been forty years since the last occurrence in North Carolina so it is a new state bird for virtually every birder in the state. 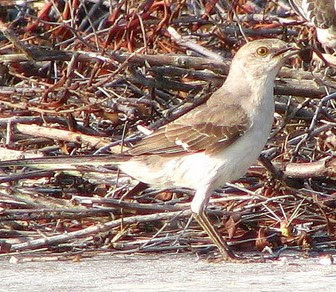 Below is the actual sage thrasher currently being seen in Swannanoa, NC. Note the olive-gray upperparts of the sage thrasher in comparison to the bright reddish-brown of the brown thrasher pictured below the sage thrasher. Otherwise, the profiles and other markings are similar. The brown thrasher is much larger than the sage, by about 40%. The mantle color of the sage thrasher is actually closer to that of Northern mockingbirds. though the general shape of the closely related species is similar, with a good view it is easy to see the overall differences between the two. With only a rear view, an inexperienced birder could overlook the sage thrasher i suppose. I found a nice bird last Saturday when I played some marsh bird calls at an extensive wetland off Marvin Road in the southern part of Mecklenburg County. A Virginia rail answered a playback of the species's raucous grunting call. I have located this species before at that location; I was even able to get a decent photo of one in April 2014. That's not easy to do. Virginia rails, like other rails prefer to stay hidden in thick marsh vegetation. The birds are inquisitive though and will readily approach a tape of their calls. the trick is to catch a glimpse as they creep through the grass. Rails don't breed or winter here but they do pass thru in the migrations and may stay for short periods of time in a suitable location before moving on. In the photo below of the bird from 2014 it is easy to see how getting a good look at one can be challenging. They know how to keep a sight barrier between themselves and a birder. 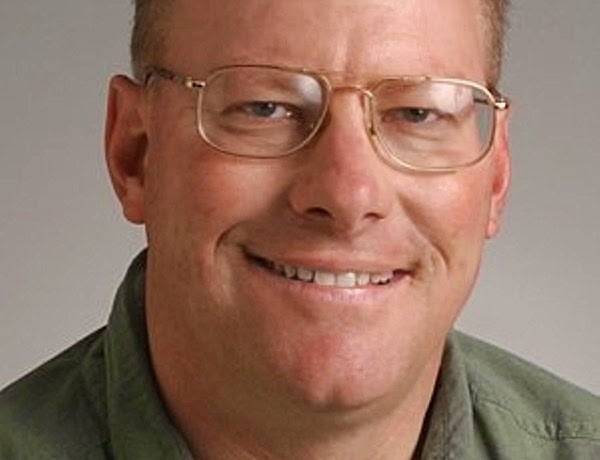 North American birders got some anticipated news recently. The annual Winter Finch Forecast for 2015-2016 came out. The Winter Finch Forecast is a prediction of which of the northern finch species will move east, west, or south this winter; and which ones won’t. It appears purple finches may come south in small to moderate numbers, while other species such as pine siskins will stay put. That will be a relief to those of you who hosted hordes of siskins in recent winters and had to dole out extra seed money to keep them happy. The Winter Finch Report is based on the productivity of the food crops in the border states and Canada. It is usually pretty accurate. We may not know exactly how accurate until after the first of the year, but I’m pretty sure southeastern birders will not be looking for redpolls, crossbills, and evening grosbeaks this winter. Read the Winter Finch Forecast for yourself at http://www.jeaniron.ca/2015/forecast15.htm. It appears that purple finches may be the only "winter finch" to come to area feeders this winter. 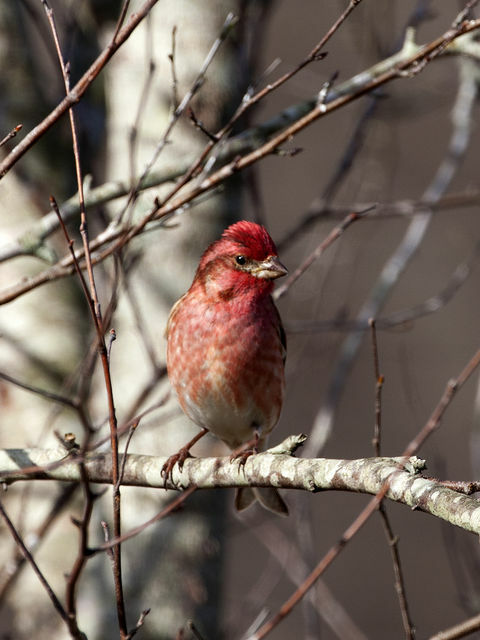 Male purple finch by John Ennis. By now the birds that we commonly think of as Neotropical migrants have passed through. 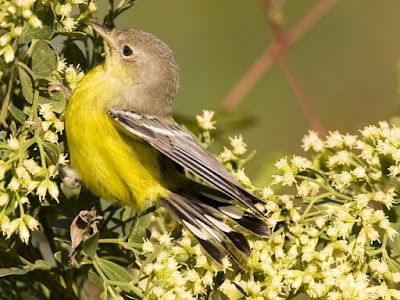 Gone are most of the warblers, tanagers, thrushes, and flycatchers that drew birders into the field from late August to mid-October. There may be a few individual stragglers and a couple of late-migrating species to be found but the transition is well under way from familiar breeding birds to familiar wintering birds. 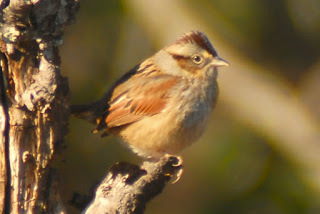 I’ve been looking for some of the more uncommon sparrow species lately, without much success as yet. But I have come across some returning species just about every day out. The first true winter bird I found was a swamp sparrow in a cattail patch at a pond’s edge. Swamp sparrows are pretty easy to find in appropriate habitat but are tough to get away from wet habitats. 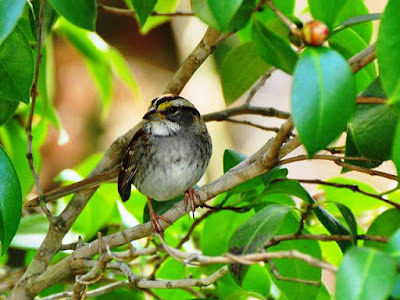 Later the same day the first white-throated sparrow was seen. The white-throateds are one of the more abundant of our wintering sparrows. Yellow-rumped warblers have replaced the multiple species of warblers I have enjoyed since August. The yellow-rumpeds are the most common winter warbler. 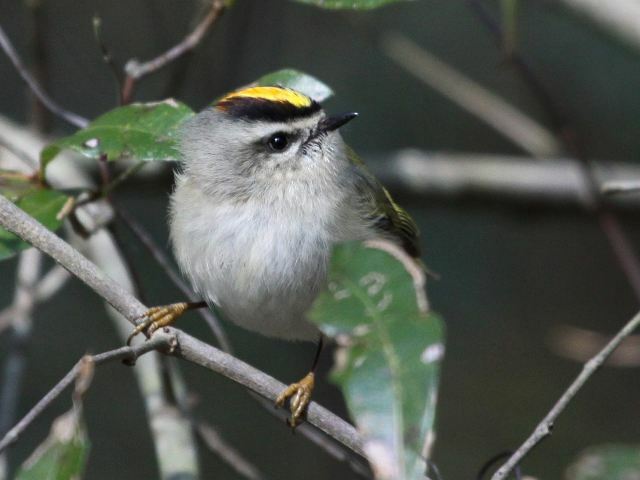 The extremely high-pitched calls of golden-crowned kinglets came be heard from pines now. The calls are so high that some birders cannot hear them at all. That makes them tougher to see; they are really tiny. 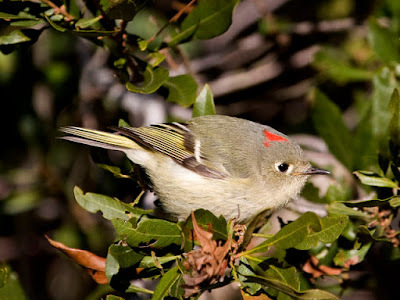 Their equally small cousin the ruby-crowned kinglet is finally here as well. House wrens are fairly common breeders in our area but the species completely changes habitats from summer to winter. By summer they are a bird of large residential yards and gardens. During the winter they move into brushy fields. I suspect the winter birds are from more northerly populations. 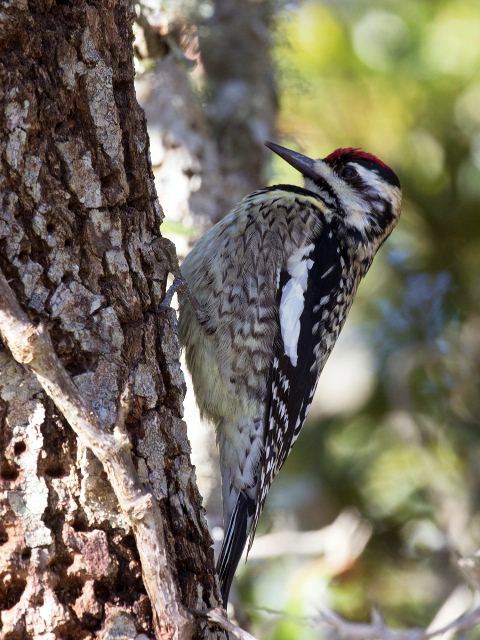 Yellow-bellied sapsuckers, our only woodpecker that isn’t with us in the summer, have returned to their favorite sap trees by now. Hermit thrushes, our only winter spotted thrush, will be here soon if not already. The first sizable flocks of cedar waxwings are now being seen overhead. I haven’t seen any winter finches yet, and I may not this year. Predictions are for a poor flight into the Southeast. The same goes for red-breasted nuthatches. They could yet come in though. Every winter is different and is sure to hold a few surprises. If you remember last Saturday, the weather was pretty lousy for outside activity, or so I thought. I was scheduled to lead a bird walk at Four-mile Creek Greenway. To my surprise four people showed up, two very enthusiastic Middle School aged boys each accompanied by a supportive parent. Despite the steady rain and my bargaining attempts to reschedule the group was gung-ho to do some birding. I really thought we would be lucky to see anything at all, but I am not going to be out-weathered by anybody and besides, I remember how I was at their age. There were birds to see and rain was nothing more than a minor inconvenience. So off we went, and I am glad we did. I soon realized that there were small feeding flocks of migrants every couple of hundred yards along the trail. The first stop yielded a just-arrived white-throated sparrow, brown thrasher, and a very inquisitive magnolia warbler that swooped right in for a closer look. That was a life-bird for everyone; a pretty good start. 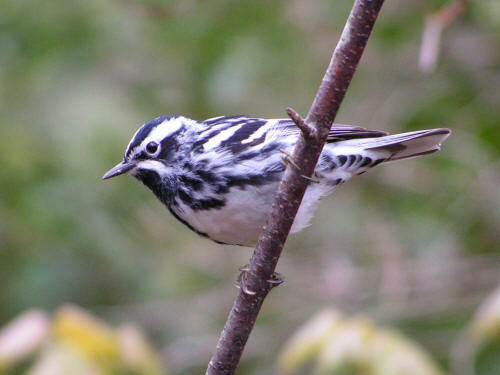 A black-and-white warbler, palm warbler, and two gaudy American redstarts awaited us within the next flock. I walked right by a dozing barred owl, unfazed by us or the rain. As is often the case in birding groups, the last person in line spotted it. At the large cattail marsh, a flock of four indigo buntings, a couple of swamp sparrows, a common yellowthroat, and another brown thrasher posed nicely for our party. We took a short break from birding to examine some green treefrogs and cattail caterpillars. Back into the woods, a couple of Eastern wood-pewees called to each other. The birds seemed really agitated at the next spot and soon we knew the reason why; a large immature Cooper’s hawk launched off its perch and flew right over. Woodpeckers put on a good show with multiple individuals of red-bellied and downy seen, with an individual hairy woodpecker and Northern flicker to boot. In all we ended up with about 34 species on a day when I thought we would be lucky to identify a quarter of that number. And I was reminded that birds don’t come in out of the rain and adverse conditions are no match for youthful enthusiasm. It is a rare event when I get to add a bird to my North Carolina State List anymore, and even rarer when I add a bird to my Life List without some extensive travel. I was able to accomplish adding a species to both lists last Sunday when I made a run to Winston-Salem to check off the buff-bellied hummingbird I told you about last week. The bird had been seen at two feeders at houses across the street from each other. When I arrived the bird was sitting on a front yard feeder taking a leisurely drink. No waiting. 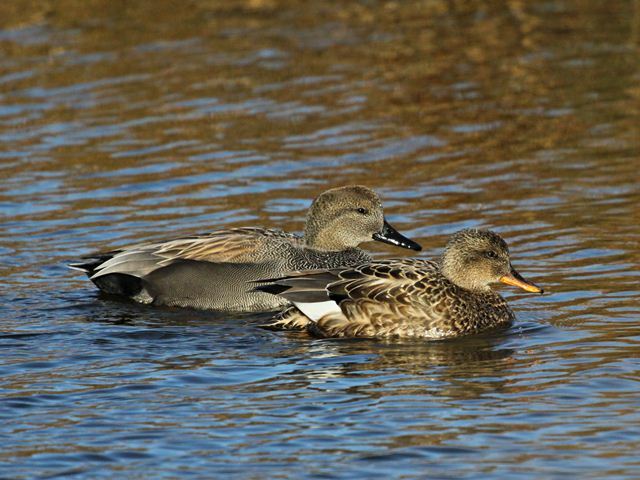 That North Carolina species #411 is one accommodating and cooperative bird! It is a nice adult male, which always makes identifications easy in hummingbirds. Check out some photos of the females of a few species and you will soon find many of them look pretty similar. I don’t know how many birders have made the trip to see the bird but it is not unusual for over a hundred folks to chase such a rarity. All have been successful as far as I know. I’m glad I was one of them. I feel fortunate the little guy has hung around for some weeks. Eventually it will depart when a strong cold front finally pushes through. I have gotten some questions recently about the movements of hummingbirds through our area. For the most part, the bulk of the ruby-throated hummingbirds have passed through the mountains and piedmont of North Carolina by now. There will be a few stragglers from now through the end of October, but watch as their numbers gradually dwindle with each passing day. Really, by mid-October they are almost all gone. But that doesn’t mean that hummingbird action is over for 2016. To the contrary, the most exciting time to look for and attract hummingbirds is from now through the end of the year. 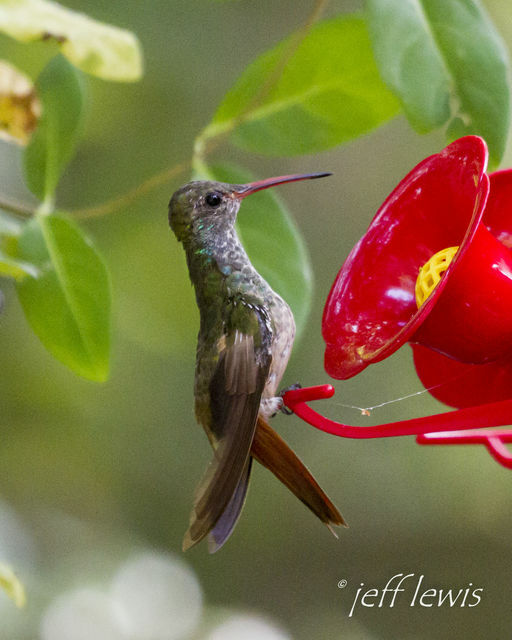 Notice I mentioned the ruby-throated hummingbirds will be gone by the end of October. But there are other species that will come into the Carolinas in varying numbers by species. Case in point, right now there is a buff-bellied hummingbird in Winston-Salem, North Carolina. That bird is only the second confirmed record of the species from North Carolina. Buff-bellied hummingbirds regularly occur in the United States in extreme southern Texas. 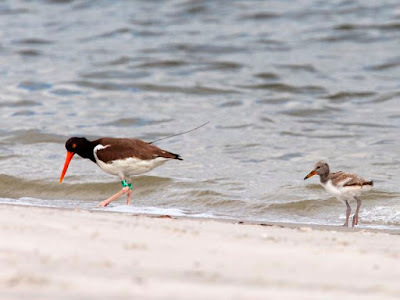 The species will winter along the Gulf Coast in small numbers, with an extremely rare individual occasionally overshooting into neighboring states and regions. At times of high bird movement; spring and fall migrations especially; there is an increased chance of a rarity being discovered. 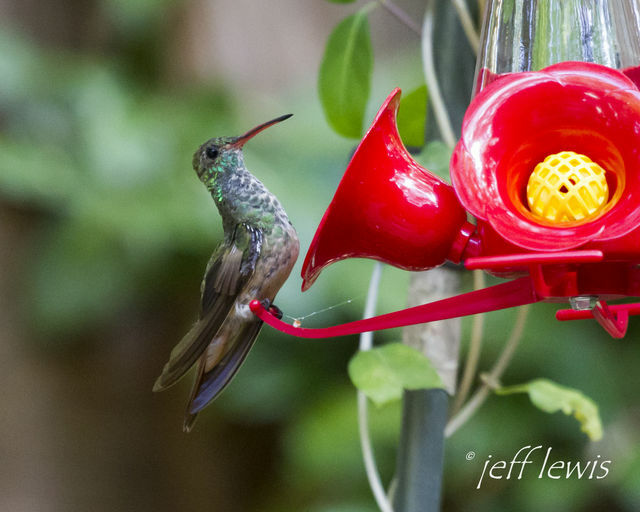 So, will you attract a mega-rarity hummingbird this fall? Almost certainly not. But you definitely should start taking a close look at any hummingbirds that are still hanging around or arrive in the next several weeks. 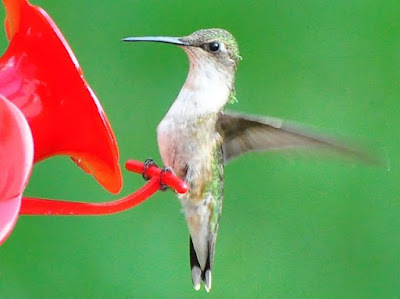 I will write more about wintering hummingbirds in a few weeks, but in light of the buff-bellied hummer in Winston-Salem I thought it might be worthwhile to remind everyone to keep a close eye on the feeders.